An Unrelenting Francophile Also Arrives in Newport! The arrival of Lafayette’s Freedom Frigate has been awaited breathlessly by me for 20 years. I am a nut about anything and everything French, so this is an event­ not-to-be- missed! For ages I had been getting letters, construction up-dates on the building of the 1780 Hermione replica, brochures and postcards of the finally-finished frigate from my friend, Lily, in France. All these publicity materials built up on my desk to a dizzying height. An Hermione look-see was rising to the top of my to-do list for this July. 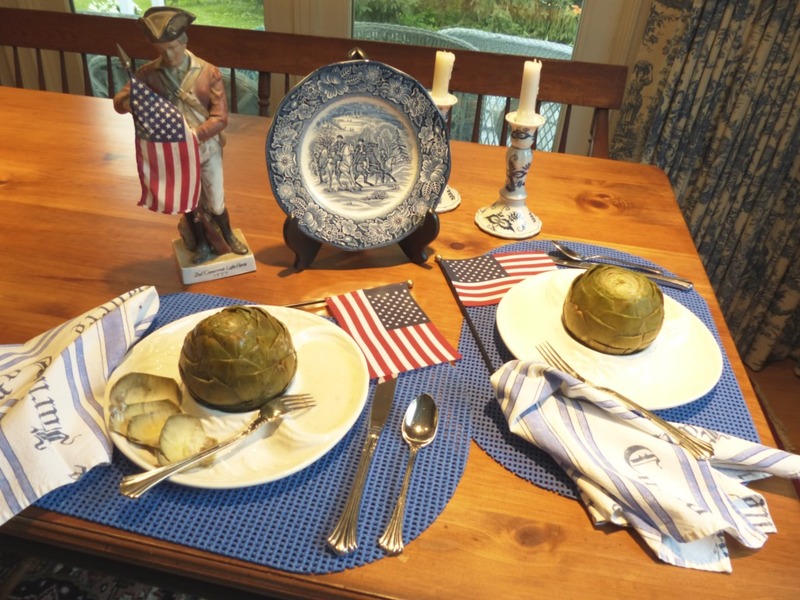 I simply had to convince my husband to drive to Newport and spend 3 days taking in all the Lafayette military events and VIP luncheons we could cram into our short stint by the sea. After all, Newport was a key component in the history I had written on Rochambeau and his American campaign. I could, as they say, kill two birds with one visit. I knew Lafayette way before I knew Rochambeau. Lafayette was my first love as a hero on two continents way before Rochambeau eclipsed him. I cajoled my daughter and my granddaughter from Cape Cod into joining us along with 4 others from as far away as New Jersey. Nearly everyone in our group professed at least a passing interest in history. My daughter, on the other hand, after working with me to edit my military history on Rochambeau, shyly confessed to me when finished, that she really did not even vaguely like history!! This admission came after we had spent multi hours each week over 3 ½ years, editing my book on the phone between Connecticut and Massachusetts! One of us had to be crazy about something to hand on that long! Anyway, here we were in Newport with her precise list of the events and iPhone in hand. We got up at the screech and broke out of the Jailhouse Inn in the center of old Newport to make our way to the first stop. Trinity Church. We ambled up to the front door only to find that it was guarded by the legendary Rhode Island Regiment in their unmistakable white uniforms. I spoke with their commander whom I met at an earlier re0enactment, posed for a few photos with the soldiers and entered the church. There was to be a dedication inside followed by a memorial ceremony outside by the grave of French Admiral de Ternay. I remember him well. He played an important part in the early section of my book. De Ternay commanded the 40 ship convoy to a safe harbor at Newport after a 70 day crossing. Rochambeau sailed with him on the flagship. The Admiral did his part in bringing about the last turning point of the American Revolution. He deserves to be remembered. When we four entered the church, my daughter said we should look for Washington’s pew at the front, which we did. We mogged along behind her and seated ourselves at the front of the church beside the raised lectern. The pews were reminiscent of those at Paul Revere’s Old North Church in Boston, with tall sides and a door opening into each pew. We settled in to wait for the action. In a few minutes there was a tap on my shoulder. Someone said, “Would you mind moving back just one pew please? This one is reserved for General Rochambeau.” I assented, and we happily removed ourselves to the next pew. Presently a man in fine French military regalia slipped quietly into Washington’s pew. This was truly an unexpected opportunity for me, always ready to step back in time to make conversation with one of the characters in my book. Wasn’t this the reason I came to Newport after all? Here was a real live Rochambeau up close and personal. I asked my daughter to take a few close-up pics of the General and myself as I deftly stepped forward to greet him. Not knowing if he spoke French or English, I began in French and found him most agreeable. I believe he welcomed my company as sitting alone in the midst of a large crowd can make one uneasy. I asked him if he was American. He said, “presque” (“almost”) I did not inquire further, thinking that perhaps he had moved here, but was not fully acclimated. He intimated that he was new at re-enacting the part of Rochambeau. One would not have guessed that since his uniform was perfect in every way. 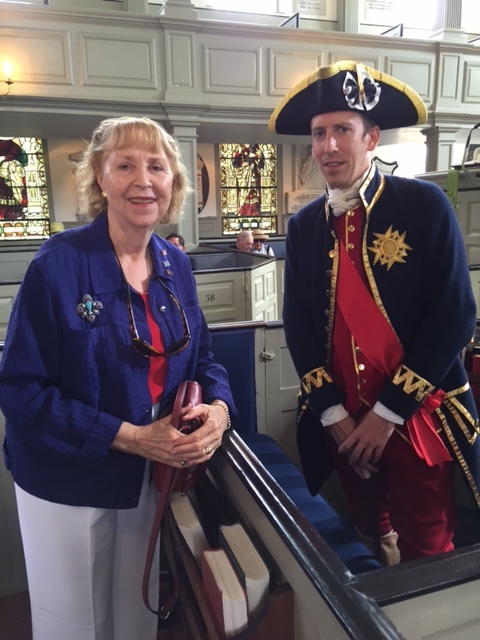 I was puzzled that he did not remove his tricorne hat in church. I felt that it was more than opportune that I should be seated next to the object of my biography and told him of my having written his bio. He was shocked into silence. We exchanged business cards and, I returned to my pew after we posed together for the required photos for my second burgeoning scrapbook on the subject of the general himself . After the short dedication to de Ternay ( and Rochambeau ( the former alive here and the latter buried outside) by the female Canon of Trinity Church, we marched out first-row-first, with the four of us just behind the General. As we reached the door it popped into my head that as the General had risen to his feet to lead the procession to the graveyard, I could not help but notice that he was super tall and narrow of build, more like a George Washington than that of the shorter, stocky, Rochambeau. One cannot expect true-to-life at the last minute. Outside our front pew General in his handsome black leather knee-high boots stood at the head of the oversize wide, long, flat stone that more than covered the grave of Admiral de Ternay. Rochambeau removed his hat for the playing of taps and the singing of the French and American national anthems. The Canon spoke a eulogy, the Admiral of the Navy War College of Newport extolled de Ternay’s valiant effort, and the Commander of the Rhode Island Regiment placed a wreath of delicate white flowers on the gravestone below the Latin inscription. We stood with hands over our hearts during the anthems, sorry for the fact that the French admiral who did a yeoman’s job of avoiding capture by the British on the high seas to land his 5,500 Special Expeditionary French forces on friendly soil in Newport almost 235 years ago to the day, would die after only 5 months into his land mission in America.